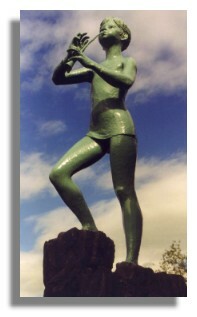 The town of Kirriemuir in Angus will be forever associated with Peter Pan as a result of the author, J M Barrie, being born there at 9 Brechin Road on 9 May 1860. But if you visit the town you will find that there is a lot more than just a shrine to a famous author. James Mathew Barrie was the 9th child of a weaver. Even as a child, he wrote for the school magazine and drama group (in which he also acted). He took a Master of Arts degree at Edinburgh University and after a short spell with the Nottingham Journal he moved to London in 1885 where he became a journalist. 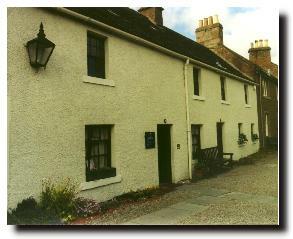 He also wrote a number of books (including stories based on life in Kirriemuir) and then turned to writing plays. "The Admirable Crichton" was published in 1902 but it was "Peter Pan" which caught the imagination of audiences. This was followed by "Peter and Wendy". Royalties from Peter Pan have been awarded in perpetuity to Great Ormond Street Hospital for Sick Children in London. Barrie was knighted in 1913 and became Rector of St Andrews University in the same year (delivering a notable address on "courage" at his inauguration). He died in 1937 but, unlike many other literary greats, he is not buried at Westminster Abbey. At his own request, he is buried in his native Kirriemuir. During the 1930s, there were rumours that Barrie's birthplace was going to be sold, taken down stone by stone, and re-erected as a Barrie Museum in the USA. But shortly after Barrie's death in 1937 a wealthy philanthropist bought the property and donated it to the National Trust for Scotland. The house is furnished as it was in Barrie's day. For example, on the day of Barrie's birth, the family bought six hair-bottomed chairs. Barrie later took some of them to London but two are still in the house. In the parlour is a "contract" which Barrie made with the six-year-old Princess Margaret after he had incorporated some words she had said to the author into one of his plays. In the kitchen is a "box bed" which would be used by the parents. Barrie and his nine brothers and sisters would have slept upstairs. When Barrie was born, the midwife's name was Nanny Mathew - hence his middle name. The house now incorporates an "exhibition room" with a tableau of the young Barrie being told stories by his mother and examples of the original costumes worn at the first production of "Peter Pan". There are also models of some of the famous scenes from his plays - including Wendy watching Peter Pan flying through the window of the Darling house. Unfortunately, as in all National Trust properties, no photography is allowed inside the house! Also in the house is the desk from Barrie's flat in London and an overwhelming amount of souvenirs and memorabilia. In Barrie's childhood the communal wash-house located near the house was to play an important part in Barrie's childhood. He performed his first play there (at the age of seven!) and according to his dedication to Peter Pan the wash-house was the origin of the house the Lost Boys built in Never-Never Land for Wendy. So it is appropriate that this building and the ground outside should have been turned into an adventure playground. 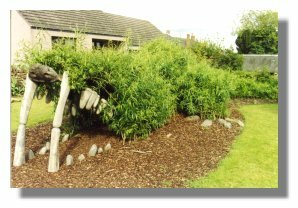 Outside is a statue of Peter Pan and bamboo has been grown in the form of a crocodile. As can be seen from the photo here, the bamboo make realistic-looking teeth which children can walk through! Also in Kirriemuir is a "camera obscura" (one of only three in Scotland) donated to his home town by J M Barrie. The camera obscura is located at the local cricket ground as Barrie was passionately interested in the game, but the camera also gives excellent views of the Angus glens. Barrie claimed that he played twice for the local cricket club - "The first time I scored one run, the second time I was not so lucky".